"Everyone's path is different. The best way to get lasting results is to have a plan that fits you specifically. Get stronger, move, eat real food, and focus on improving in some way every week." Josh has a Bachelor of Science in Kinesiology from Kansas State. He has been a personal trainer for over 12 years and has experience training all types of clientele. 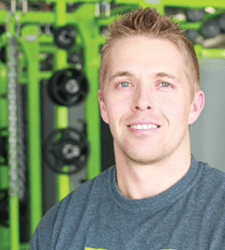 Josh's main focus is helping clients make the lifestyle changes necessary to get and maintain results. In his spare time Josh loves to travel and hangout with his wife Paige, kiddo Kirra, and dogs Duke and Grace.